For the first time since the 19th century, scientists have discovered a new area inside the Great Pyramid of Giza. Originally published in Nature, Egyptologists are calling the find a significant discovery but aren't sure exactly what it may mean yet. 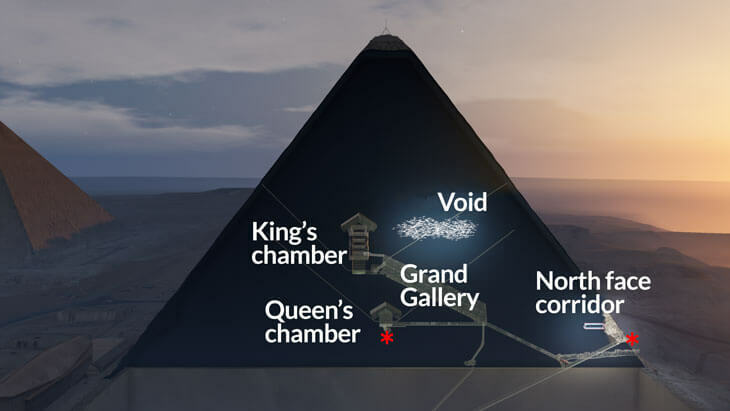 To locate this new area, named "ScanPyramids Big Void", the archaeologists partnered with particle physicists to scan inside Khufu's Pyramid. The researchers were able to see inside of the pyramid through the use of muon detectors. Muons are subatomic particles that come as a byproduct of cosmic rays striking atoms in the atmosphere. They continuously bombard Earth at the speed of light, passing easily through air. However, they are absorbed or deflected when they strike solid objects like rock. By placing the muon detectors at the base of the pyramid as well as inside the structure itself, the scientists were able to detect the large empty space. It measured about 30 meters across and is positioned above the Grand Gallery and adjacent to the King's chamber. This whole experiment has been months in the making. The amount of muons received at the detector is proportional to the makeup of the rock on the other side. Due to the massive size of the pyramid, 99% of all the muons are obstructed before they can even reach the detector. This meant that it took several months to collect enough data for the discovery. The scientists have verified the size and location of the void with both chemical and electrical muon detectors placed at different locations.